On July 16, 2018, the Holy Father Pope Francis appointed Mgr. Launay Saturné as the new Metropolitan Archbishop of Cap-Haïtian. He will replace Monsignor Max Leroy Mesidor. Mgr. Saturné was the President of the Episcopal Conference of Haiti CEH and Bishop of the Diocese of Jacmel. He made a reputation for being outspoken. He recently denounced the living conditions of Haitians and some decisions of the current Government. On July 16, 2018, Monsignor Launay Saturne, 54, was appointed as the Bishop of Jacmel, Metropolitan Archbishop of Cap-Haitien (Haiti). 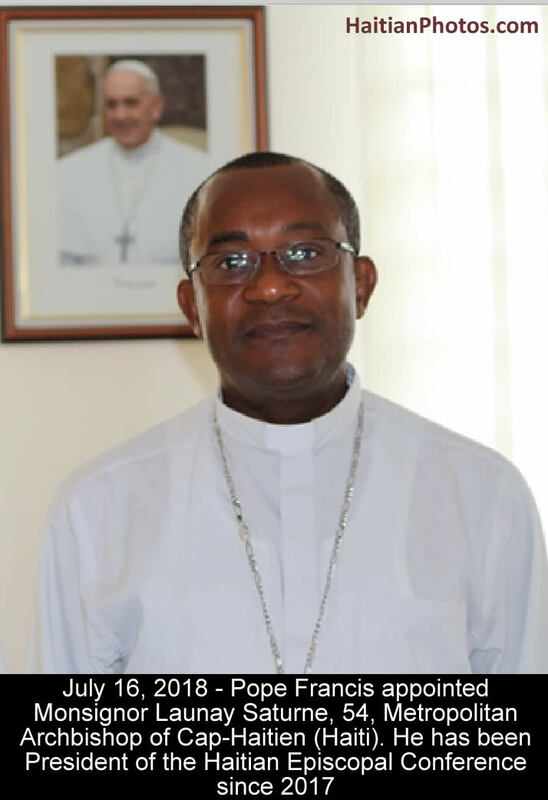 Monsignor Eugene Martin Nugent, the Apostolic Nuncio to Haiti confirmed that the Holy Father, Pope Francis has appointed Monsignor Launay Saturné (President of the Episcopal Conference of Haiti CEH and Bishop of the Diocese of Jacmel), as the new Metropolitan Archbishop of Cap-Haitien. He replaced Monsignor Max Leroy Mesidor, enthroned Archbishop of Port-au-Prince in last January. The new appointment came amid a tensed situation between President Moïse and the CEH. Monsignor Saturne was never a choice of President Moïse because of his outspoken nature. Launay Saturné was born on January 14, 1964 in Delatte (Petit-Goâve) in the Archdiocese of Port-au-Prince. He became ordained priest on March 10, 1991 for the archdiocese of Port-au-Prince. Then he took the responsibility of Vicar of the Sacred Heart parish of Turgeau, at Port-au-Prince (1991-1997), and Director of the Propedeutique [foundation course for first-year University students] House at Jacquet, for the Archdiocese of Port-au-Prince. From 1998 to 2003 he studied at the Pontifical Gregorian University in Rome, obtaining a doctorate in Dogmatic Theology (Ecclesiology). The Holy Father, Pope Benedict XVI named him as the Bishop of Jacmel in April 2010. Since November 2017, he is the President of the Episcopal Conference of Haiti. On April 28, 2012 when he was named Bishop of Jacmel by Pope Benedict XVI, he said, "the construction of physical buildings is not enough; we must rebuild the Haitian people." He called on the government of Haiti to develop vocational training programs, and to make public education available to all young people. He criticized the task of the Provisional Electoral Council that brought Martelly into power.